Political Evacuation – Often lumped together with non-medical or security evacuations, political evacuations are for situations where one fonds themselves either trapped or expelled or at bodily risk due to civil uprisings, riots, military coups, political unrest, or being identified as a “persona non grata” or being forcibly expelled from the country you are visiting. Security evacuations are different from political evacuations. Unlike a security evacuation (necessary for impending natural disasters, etc. ),…a political evacuation is for situations of political instability, civil unrest, or military action. When comparing short-term plans, some clients are interested in seeing what benefits each carrier has in case they might need to be political evacuated due to instability of their destination, etc. Depending on the plan this can vary greatly. Most plans will deny benefits if the USA or British Foreign office has issued a State Department travel warning prior to your departure and within 6 months of your travel dates. This benefit will usually also not cover you in the event that an advisory to leave a certain country or location is issued by the United States government after the insured person’s arrival date, and the insured person unreasonably fails or refuses to to heed such warning or depart the country or location. If you are considering political evacuation due to travel to a country where you might be at risk, we’d recommend our Diplomat International plan. 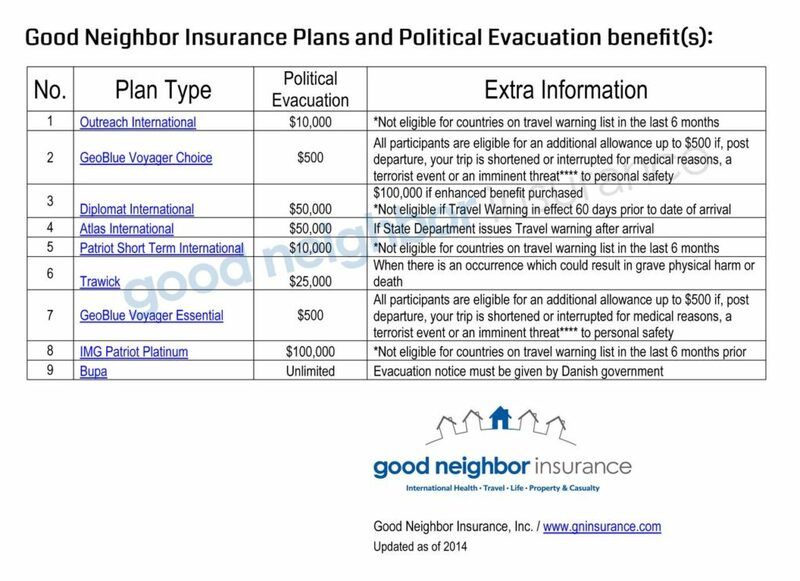 You may also want to consider BUPA or if you’d like having stronger medical coverage and benefits in addition to political evacuation, check out our IMG Patriot Platinum Plan.